A new climate agreement intended to ensure “carbon-neutral growth” in international aviation could lead to a massive increase in demand for problematic offsetting projects. Offsetting schemes for airports are a further measure to provide “green” legitimacy to the growth of the industry. At this very moment, at least half a million people are airborne. Air traffic has grown massively in recent decades, significantly outpacing other economic sectors. The steep climb isn't over yet: Over the next 20 years, the number of aircraft and passenger-kilometers flown is expected to double. Some 1,200 new airports or expansions of existing ones are currently planned – a number of them mega-project that include entire shopping areas and industrial parks that will result in the destruction of extensive ecosystems and the displacement of residents, as well as noise, particulate emissions and other health hazards. The European Commission has high hopes for the future nonetheless: “Sustainability is finally becoming the way we fly!” The UN’s International Civil Aviation Organization (ICAO) adopted the Carbon Offsetting and Reduction Scheme for International Aviation (CORSIA) agreement in coordination with the aviation industry in October 2016. Its goal is to ensure international aviation’s “carbon-neutral growth” from 2020 onwards. As the name of the program suggests, the focus is on offsetting emissions through savings elsewhere. While some governments and NGOs have criticized its countless omissions and non-binding aspects, the devil is not only in the details: tough questions need to be asked about the underlying logic of the climate strategy in general. Is carbon-neutral growth in aviation possible? The concepts of a “green economy” or “bio-economy" assume that economic growth can be decoupled from resource consumption and emissions, with hopes for new technologies playing a key role here. However, the outlook for a technological breakthrough in aviation – for example with regard to electric drives or superlight aircraft – is even less promising than in other sectors. Even if one were to be realized, its effects would not be felt for decades to come – too late in view of the intensifying climate crisis. Meanwhile, the planned efficiency gains in kerosene consumption of new aircraft amount to 1.5% per year. With growth rates in air traffic of up to 7% (2017), the prospect of achieving carbon-neutral growth through technological solutions is an illusion. The aviation industry therefore now hails offsetting emissions rather than reducing them as the solution that would be “the quickest to implement, the easiest to administer and the most cost-efficient”. This offsetting is usually outsourced to countries of the global South. For example, many offsetting projects involve the construction of hydroelectric dams that claim to obviate the need for power generation using fossil fuels. 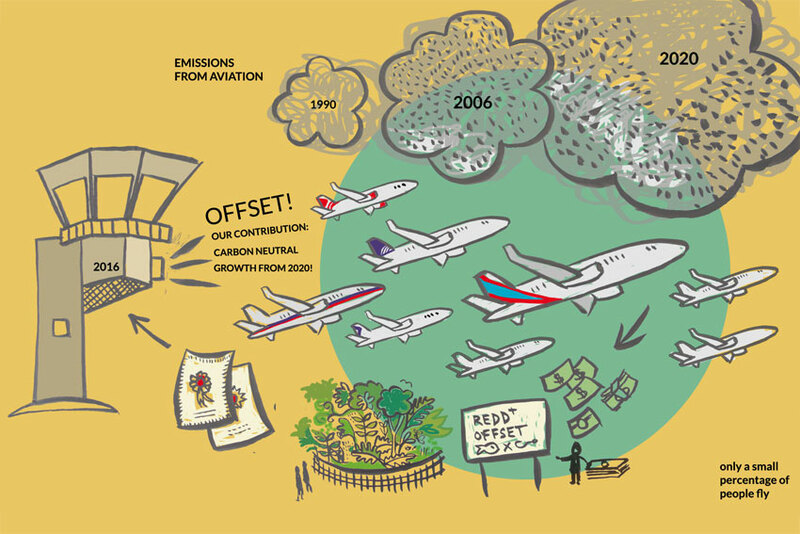 Operators of REDD (Reducing Emissions from Deforestation and Forest Degradation) conservation projects can also sell their purported emissions reductions to the aviation industry as offset credits. It is estimated that fewer than 5% of all people have ever boarded an airplane. To enable a small part of the world’s population to fly ever more often, others are expected to cut back on greenhouse gas emissions: people whose emissions are generally very low, whose historical contribution to climate change is negligible, and who are already feeling the consequences of the climate crisis. The logic of carbon-neutral growth at the expense of others is therefore fundamentally problematic. Furthermore, the promise of carbon neutrality is not feasible in reality. Germany’s Öko-Institut examined the effectiveness of existing offset projects for the European Commission in 2016. It analyzed the United Nations’ most important compensation instrument, the Clean Development Mechanism (CDM). The researchers found that only 2% of offset projects are highly likely to have led to additional emission reductions. For example, hydroelectric power plants are usually profitable in themselves and are not built for the purpose of offsetting emissions. Nevertheless, the emission rights thus sold legitimize an increase in greenhouse gas emissions elsewhere. A study by the New Climate Institute performed for the German Federal Environment Agency in 2017 also found that only 4% of offset credits come from projects that depend on CDM revenues. Therefore, if airlines purchase offset credits to cover each additional ton of CO2 they emit as of 2021, this will not cancel out their emissions but lead to an almost unchanged increase in greenhouse gases – albeit under a green mantle. It is expected that the implementation of CORSIA from 2021 will lead to an enormous demand for offset credits. The criteria – if any – that will apply to the recognition of offset credits under CORSIA remain to be seen. It is possible that the ICAO will not impose any restrictions with regard to the current relevance, additionality or the ecological and human rights impacts of the projects. This would mean that airlines would be able to use thousands of CDM credits that are currently dormant and obsolete as well as those from providers in the so-called voluntary carbon market, including particularly controversial project categories such as REDD+. The ICAO forecasts operating costs of 0.2 to 0.6% of total revenue from international aviation for 2025, and 0.5 to 1.5% for 2030. This is significantly less than the costs resulting from normal fluctuations in the price of kerosene. The original idea was that the increased cost of purchasing credits would encourage airlines to deploy technologies with a lower climate impact, or that the costs would lead to higher ticket prices and lower demand for air travel. But this original intention is long obsolete. In fact, with its offset strategy, the industry has achieved what it wanted: to ward off effective measures to limit air travel, such as the abolition of aviation’s countless tax privileges. Kerosene, for example, is currently not being taxed. Limiting the average global temperature increase to significantly less than 2°C would require reducing emissions from international air traffic by at least 39% relative to 2005 levels by 2030. The ICAO target of capping emissions from 2020 onwards is therefore completely inadequate. In addition, CORSIA only takes the climate impact of CO2 into account. The ICAO continues to disregard the remaining scientifically documented climate effects of aircraft emissions (ozone, contrails, induced cloudiness, etc. ), which are at least twice as great. CORSIA will start with a voluntary pilot phase in 2021. The mandatory phase will not start until 2027 (and will run until 2035). But even then, not all countries are required to participate: No less than 118 of 191 countries – least developed countries, small island developing states and landlocked developing countries in particular – are exempt. Another problem is that there is currently no mechanism in sight that would prevent a double counting of emission reductions. This increases the risk that emissions will only be offset on paper – if at all. For example, a REDD project operator in Brazil could sell offset credits to a European airline, while Brazil simultaneously counts the emission reduction toward the national reduction target that all countries – not just the industrialized ones – have been required to implement since the Paris climate agreement. Food in the fuel tank? In addition to the issue of offsetting, international aviation intends to rely on controversial “sustainable alternative fuels”. The single currently realistic alternative to fossil-based kerosene is vegetable oil. The only way to produce the required quantities of such fuels economically would be to use palm oil, which is already one of the driving forces behind deforestation worldwide. Of the original twelve sustainability criteria, the ICAO dropped ten in 2017, including those on land rights, food security and biodiversity conservation. What remained was the condition that alternative fuels produce at least 10% lower emissions than conventional kerosene. This wording gave Saudi Arabia an opening to demand that “clean oil” be deemed a green alternative fuel. Airlines can thus enjoy lower reduction commitments if they use kerosene produced in new, more efficient refineries, or in refineries running on renewable electricity. Some EU states have called for the reintroduction of the dropped sustainability criteria. Studies by Changing Markets and others show that this would also be inadequate, however. Sustainability criteria and certifications fundamentally lack credibility and binding character. In the palm oil sector, for example, none of the existing schemes has so far succeeded in reducing deforestation, drainage and biodiversity loss. In an open letter dated June 11, 2018, 90 organizations underscored that CORSIA could make the aviation industry a new driver of deforestation, land grabbing and human rights violations, and called for effective measures instead of offsets and biofuels. CORSIA is driving demand for problematic agricultural fuels, helping revive outdated offset projects that are questionable in terms of human rights, and will not lead to carbon-neutral growth. Furthermore, the focus on offsetting does not take into account that the current situation of the climate crisis does not permit an “either-or” choice: It is necessary both to reduce emissions at the source and to protect forests, instead of selling the carbon stored there as credits to enable the growth of polluting sectors. “Biofuels and emission offsets are dangerous attempts to deceive the public through greenwashing,” warns Almuth Ernsting of Biofuelwatch. Indeed, CORSIA is now threatening to replace stricter regulations and existing regional climate protection measures for aviation. For instance, the president of the German Aviation Association (BDL) is calling for CORSIA to replace the European Union Emission Trading Scheme (EU-ETS) island solution as of 2021, citing the double burden that airlines would otherwise bear. In Sweden, the International Air Transport Association (IATA), which represents 265 airlines, lobbied against the planned introduction of a tax on flight tickets. Other countries are currently reducing existing ticket taxes. The consequences of the offset approach are also becoming apparent at the airport level: In 2017, an Austrian court struck down the planned expansion of Vienna-Schwechat airport in order to prevent excessive climate-damaging emissions and soil sealing. The construction and operation of the third runway would have led to an increase of Austria’s total CO2 emissions by around 2%. After a higher court annulled the verdict shortly thereafter, it was decided in 2018 that the third runway could be built – subject to the condition that the airport become “carbon-neutral”, certified by the Airport Carbon Accreditation Initiative. However, the airport’s primary business – flights – is not to be included in the calculation. The restrictions apply solely to operating emissions on the ground, for example related to the terminal’s power consumption, which account for a negligible proportion of total greenhouse gases. The initiative thus benefits the operators of the airport, who were publicly criticized for the planned expansion, more than the climate. “Building climate-damaging infrastructure at a time when the climate crisis is more than clearly knocking at the door is absolutely irresponsible. This will set emission-intensive mobility in concrete for the coming decades,” says an activist of the “System Change, not Climate Change!” network who is campaigning against the third runway in Vienna. Resistance to the expansion of aviation seems to be growing internationally. Instead of spurious solutions, effective measures would include a progressive ticket tax for frequent flyers, a kerosene tax, curbing the influence of the aviation lobby on the ICAO and attractive, affordable overnight train connections, according to a position paper of the international Stay Grounded network. While this is a good article, I question the 5% figure for "having boarded an airplane" - with extremely high passenger numbers in some emerging economies, a quick paper calculation yields ~1-2 billion people, so still not the majority, but higher than 5%.